Llano Grande, Tomatlan, Jalisco Mexico. Llano Grande is a small town located on a large plain in the county of Tomatlan, Jalisco, Mexico, nestled between beautiful mountains and inhabited by farmers, ranchers and their families. It also happens to be where my wife was born and raised. Population is around 1,000 (if you count pregnant women twice) and people are all on a first name basis. LlanoGrande.net was the first internet service in the town and everyone has an email address, whether they know it or not. If you wish to contact someone here, simply send us an email letting us know and the message will be forwarded to them using the trusty pony express workers you see below. Of late, I've received a few emails from people who are either from here or are descended from people from here. I love it especially when we encounter those who remember Llano from their youth. You can hear their longing for home in every word. I remember my wife's grandfather as he neared his time to leave this world. Whenever we went to visit him in Puerto Vallarta, he would always go on and on about how he missed Llano. He would get so excited just thinking about home - I've never seen someone with such an attachment to a town. But Llano isn't any ordinary town - it's full of friendly, wholesome people, some of which have lived their entire lives here. PS. 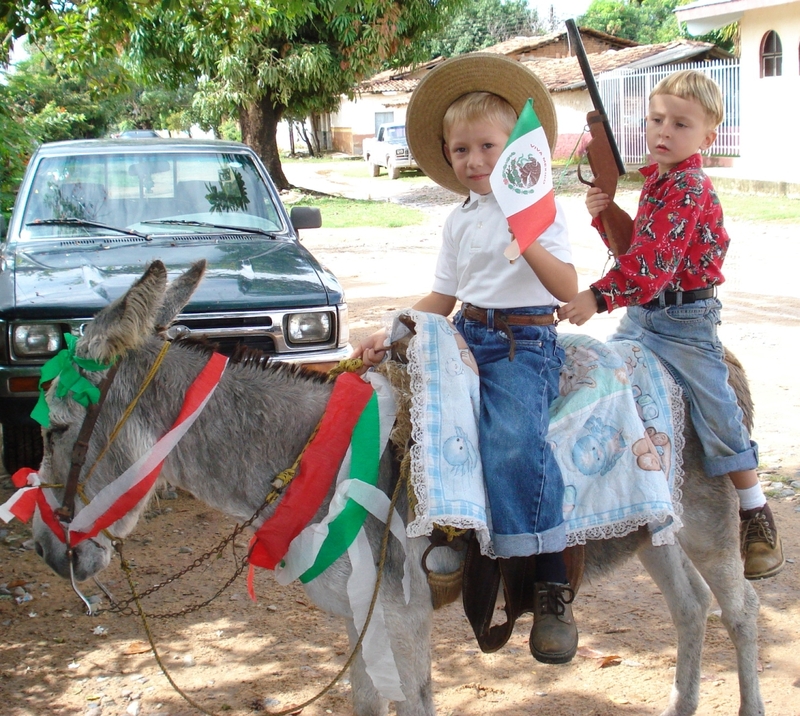 The rifle is a prop for the parade - the donkey is real.